The study of dwarf galaxies in groups is a powerful tool for investigating galaxy evolution, chemical enrichment and environmental effects on these objects. Here we present results obtained for dwarf galaxies in the Centaurus A complex, a dense nearby (~4 Mpc) group that contains two giant galaxies and about 30 dwarf companions of different morphologies and stellar contents. We use archival optical (HST/ACS) and near-infrared (VLT/ISAAC) data to derive physical properties and evolutionary histories from the resolved stellar populations of these dwarf galaxies. In particular, for early-type dwarfs we are able to construct metallicity distribution functions, find population gradients and quantify the intermediate-age star formation episodes. For late-type dwarfs, we compute recent (~1 Gyr) star formation histories and study their stellar distribution. We then compare these results with properties of the dwarfs in our Milky Way and in other groups. 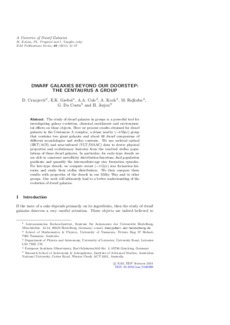 Our work will ultimately lead to a better understanding of the evolution of dwarf galaxies.